The 2016 Governor’s Awards for Excellence in the Arts honor traditionalists, iconoclasts, collaborators, and passionate supporters—and a certain state magazine. Above: One of the eight recipents of the 2016 Governor&apos;s Award Felix Lopez. HARD TO BELIEVE that a publication originally intended to talk about good roads—and culverts!—would evolve into an exemplar of arts journalism. Now in its 94th year, the magazine originally known as The New Mexico Highway Journal has accomplished just that: Governor Susana Martinez and the New Mexico Arts Commission have awarded New Mexico Magazine a 2016 Governor’s Award as a Major Contributor to the Arts. We’re in stellar company. Three of this year’s recipients have been featured in stories within the past few years, and we stand in humble admiration of all the honorees’ contributions to New Mexico’s artistic landscape. In its 42 years, the awards have amassed a roster that includes such luminaries as Georgia O’Keeffe, Maria Martinez, N. Scott Momaday, Robert Redford, Glenna Goodacre, Tammy Garcia, Tony Abeyta, George R.R. Martin, and many more. How does a travel magazine (one that still believes in good roads and culverts) end up in such lustrous company? Because early on, visionary editors saw the value of promoting the state’s unique cultural assets and employed top-notch writers, artists, photographers, and designers to carry that out. Editors like George Fitzpatrick, who logged an amazing 34 years at the helm (1935–1969), knew that arts coverage would compel people to nose around the state and start collecting. The creative tourism economy would grow, museum visits would rise, more galleries would open, and New Mexico’s national reputation as an arts capital would gleam. One of the writers who worked for Fitzpatrick was the estimable Ina Sizer Cassidy, who spent decades writing a monthly column aptly titled “Art and Artists of New Mexico.” Other writers? Mabel Dodge Luhan, Oliver La Farge, John Sinclair, Fray Angélico Chávez (Governor’s Award, 1976), Rudolfo Anaya (Governor’s Award, 1980), Tony Hillerman (Governor’s Award, 1990), and Hampton Sides. Photographers? Eliot Porter, Laura Gilpin, Douglas Kent Hall (Governor’s Award, 2005), Miguel Gandert, Jack Parsons (Governor’s Award, 2006), Kirk Gittings, and Don J. Usner. In the 1930s, before color photography became available, painters like Gerald Cassidy, Ina’s husband and a founder of the Santa Fe Art Colony, created some of our most popular covers. But perhaps the most successful of those art-covers was Tom Lea’s 1933 Winter in New Mexico (Deer Hunters), which nabbed the front spot four times. 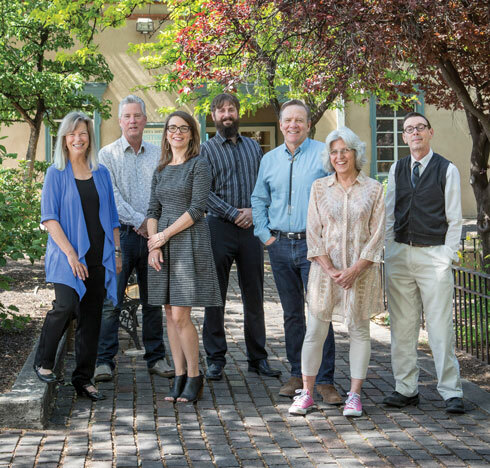 Above: The current staff of New Mexico magazine. Born to a Chippewa mother who lost him to Anglo child welfare organizations, David Bradley grew into an artist who fiercely protects what makes Native art “authentic” and joyously pokes fun at society with a reverse form of cultural appropriation. Employing a postmodern, sometimes cartoonish style with overtones of Rousseau, Magritte, and Warhol, he persuades Godzilla, the Mona Lisa, Laurel and Hardy, and other mainstream stereotypes to visit Indian Country. Everyone’s invited to the party, but attendance comes with a bite. Bradley helped found the Native American Artists Association, which successfully lobbied for passage of the federal Indian Arts and Crafts Act of 1990, and he has steadfastly argued—sometimes heatedly—for the rights of Native artists. In 2015, his brilliantly colored and impeccably rendered work won new fans with an exhibit at the Museum of Indian Arts & Culture in Santa Fe, Indian Country: The Art of David Bradley, accompanied by a gorgeous book that encompassed his life’s work. In May, the Institute for American Indian Arts, from which he graduated in 1979, awarded him an honorary doctorate. Those accomplishments are all the more remarkable given his diagnosis of ALS (Lou Gehrig’s disease) five years ago. A Santa Fe resident, he has outpaced the median survival rate of three years and three months and continues to work on his art, although, he says, at a significantly slower pace. A passion for the performing, literary, and visual arts has for years driven Rama and Ammu Devasthali to work toward the betterment of the arts in southern New Mexico. Rama, a radiologist, and Ammu, a jeweler and community activist, have donated money, wisdom, and time to causes that include the ongoing renovation of Williams Hall, home to New Mexico State University’s Visual Arts Department; the Las Cruces Art Fair; KRWG public radio; the White Sands International Film Festival; the Border Book Festival; and the Las Cruces Symphony. Native to India, the couple moved to Las Cruces in 1987. While raising their children, they experienced the warmth and generosity of the community and committed themselves to giving back to it. Their Governor’s Award as Major Contributors to the Arts recognizes their work on numerous boards and commissions, their fundraising prowess, and their establishment of the Devasthali Family Foundation within the Community Foundation of Southern New Mexico. “The business success that has accompanied professional success has enabled Ammu and me to give back,” Ramu says. “A big part of this is our support for the arts, which tend to be first in line for spending cuts when budgets are tight.” Beyond the arts, the Devasthalis are also loyal supporters of the Ocotillo Institute for Social Justice and the Downtown Las Cruces Partnership. Above: One of the eight recipents of the 2016 Governor&apos;s Award Elodie Holmes. From bumblebee-topped paperweights to sculptures as tall as the average adult, Elodie Holmes commands molten glass to do her bidding. “It’s a dance,’’ she says of work that can include glassblowing, sculpting, working over open flames, cutting, polishing, and etching. “The fire sets the tempo, and glass is the music." An internationally acclaimed artist, the Washington, D.C., native moved to Santa Fe in 1981 and, in 2000, founded Baca Street Studios, which includes her own Liquid Light Glass work area. Tucked into an enclave that includes the popular Counter Culture Cafe, the studios have helped turn the neighborhood into a buzzy arts hive that some people call “Soho Santa Fe.” She’s accomplished that through generous collaborations with other artists, including lending them space and touting their skills. 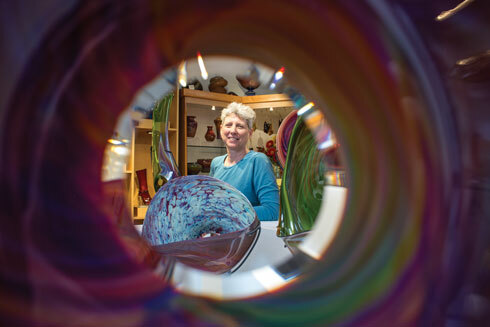 Her Prairie Dog Glass studio teaches other artists to learn the craft and sell their work in what represents, for some, their first professional space. A fearless experimenter, Holmes pushes traditional techniques into medium-defying sculptures, conjuring shapes and substances born of humble silica grains. Her work is included in the White House Permanent Collection, and other pieces have been exhibited in museums from San Francisco to the East Coast. During his first career as a classroom teacher in California and then at Española Valley High School, Felix López felt a second calling within the walls of a Santa Cruz morada. He began teaching himself the techniques of classic santeros, modeling his early work on 19th-century artist José Rafael Aragón and schooling himself in the complex iconography of religious figures. Today he’s regarded as one of the finest traditional santeros, for blending those basics with an emotional elegance rooted in his faith. He was a founding member of La Escuelita, a group of northern New Mexico santeros who shared their knowledge of natural pigments and carving techniques and became one another’s bedrock mentors. Over the past 40 years, López has won numerous honors at Traditional Spanish Market, including a Lifetime Achievement Award. 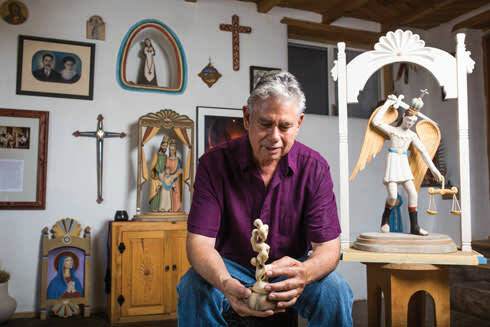 His work is held by the Smithsonian Institution, Barcelona’s Centro Nazarenum, and historic chapels throughout New Mexico, including a life-size crucifix in Pojoaque Pueblo’s Dream Chapel. He hasn’t forgotten his first calling and now teaches young carvers at Santa Fe Community College—and welcomes their thoughts on his work. He’s also brought his daughter, Krissa M. López, and son, Joseph Ascención López, into the family business. Joseph won the Grand Prize/Best of Show Award at the Traditional Spanish Market this summer. Farmers, churro sheep, carpenters, and musicians jump from Jim Vogel’s canvases—a cavalcade of the paisanos and blue-collar workers he rubs shoulders with in Dixon. A Roswell native, he now channels the artistic spirit of Thomas Hart Benton, celebrating, in a loose and illustrative style, the people and places of everyday life. “I paint to tell the stories of New Mexico,” he says. While he portrays his cast of characters in a larger-than-life light, they seem as real as anyone in the local café or hardware store. His populist paintings have traveled to exhibitions in Germany, Kentucky, Chicago, and Los Angeles. There, they so brim with life that Vogel often has to construct specially shaped frames to contain their out-of-the-box proportions. Growing up under the heavy mantle of both the Hurd and Wyeth names, Michael briefly sought a non–New Mexico life, studying in Massachusetts and at Stanford University, performing with the New Kingston Trio, then selling real estate in Chicago. But he was a ranch boy at heart and, since the 1970s, has shouldered the life of builder, preservationist, and artist. The focus of his paintings is reality—landscapes like his father’s, still lifes like his mother’s. “He doesn’t refute his heritage or the effect it has had on his work, but Michael’s style is distinctly his own,” says state representative Candy Spence Ezzell, who nominated him for the award. Hurd helped in the massive project to return his father’s mural The Future Belongs to Those Who Prepare for It from Houston to Artesia in 2015. (See our story.) He hosts painting workshops in his gallery and rents houses and gazebos on his property to tourists, aspiring artists, and luminaries like Beyoncé and Solange, who recently serenaded him on the gallery’s piano. One of the most important folk artists in the nation almost wasn’t. After early success making traditional religious art, Nicholas Herrera’s dabblings in drugs and alcohol roared into addictions and a near-fatal car accident. He worked his way back with the blue-collar skills of his El Rito upbringing. From welding and auto repair, he borrowed materials and techniques and began using salvaged wood and recycled metal in bultos and retablos that honored his roots, but endowed them with a humorous edge. In Herrera’s new world, Jesus sits in the back of a patrol car. The Magi ride Harleys behind the Holy Family. San Miguel appears more uncertain than triumphant over the snakes at his feet. His work is held by major museums, but Herrera takes time to teach art skills to children and troubled teens in northern New Mexico, and he recently roused a collective of artists to create an altar screen for a local church renovation. If he still looks like he’d be as comfortable in a biker bar as at an upscale gallery opening, perhaps that’s how he gains enough perspective to challenge his audience with against-the-tide interpretations of traditional themes. —Kate Nelson is managing editor of New Mexico Magazine. In 2001, she received a Governor’s Award as an Outstanding Woman of New Mexico.